Enjoy the satisfaction of finishing your projects in half the time by quilting them as you go! Join expert Nancy McNally as she demonstrates several techniques while making five projects. Many quilters piece their projects, and then send them out to a longarm quilter or machine quilter to put together. With the fast, fun and easy quilt-as-you-go technique, you actually quilt your projects as you piece them. This class teaches you several quilt-as-you-go methods close up and step by step while you make five exclusive projects. Create projects with the basic sew-and-flip method. Quilt a stash-buster, strip-pieced table topper. Make a French braid design with zingers. 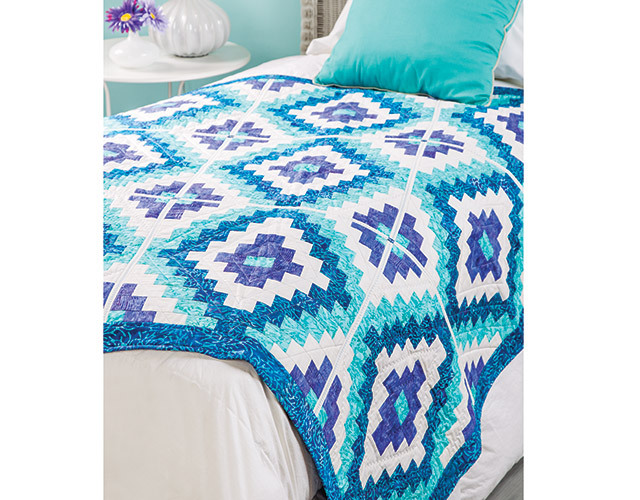 Create a gorgeous bargello-style quilt with varying shades of color. 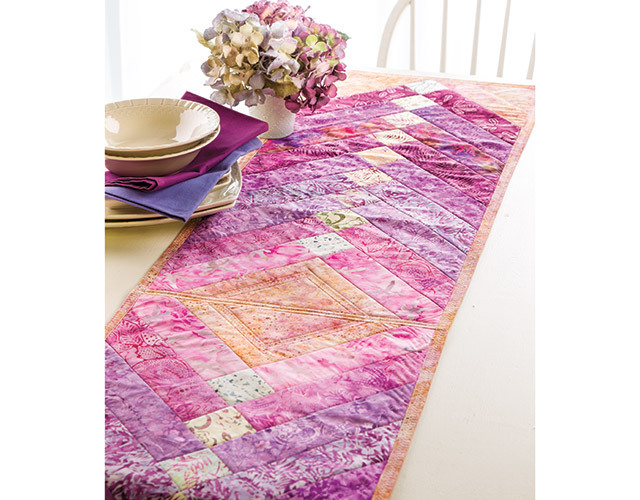 Join quilt blocks as you go with channeling and sashing. Applique motifs as you go. 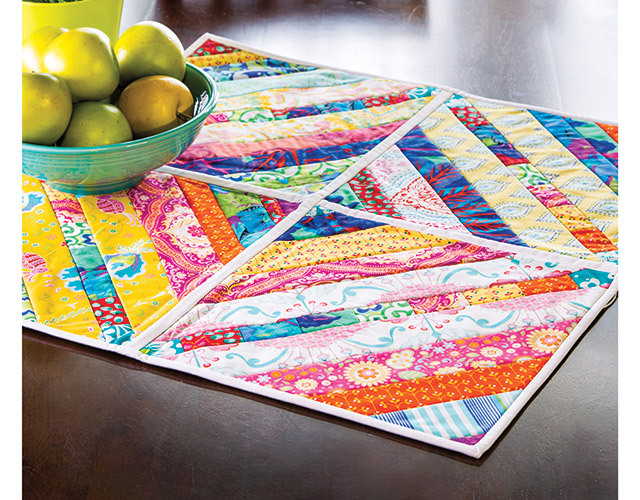 Add a sew-and-flip border around your quilts. 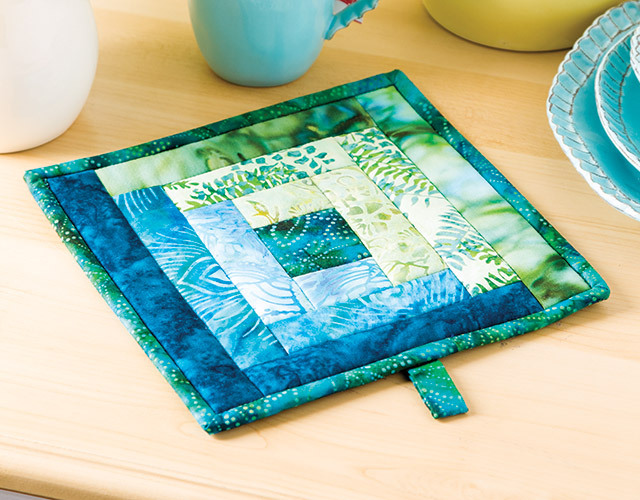 Class includes complete instructions to make five exclusive projects: Scrappy Sew-and-Flip Table Topper, Courthouse Steps Pot Holder, French Braid Table Runner, Turquoise Bliss Quilt and Baby Love Applique Quilt. At the young age of 62 I am a beginner more or less to quilting having had a sewing background all my life. I am totally enjoying the class that I have watched so far and will be watching it again to thoroughly get the hang of qayg. I will also be having my granddaughter watch it to learn when she visits this summer, I don't think 13 is to young to learn. you are a very good teacher and I appreciate you very much. Now I know what to do with all my scraps that I saved. I am enjoying my first class and am working on my first project. I think the instructor is very good. She is very easy to follow. I really enjoyed all of the classes in the QAYG class. Very informative and helped me a lot in learning the quilt as you go method. I just finished a large french braid quilt and it came out great. I was so glad that I did't have to quilt it after the piecing was done. Thank you Nancy, you do a great job instructing. Very understandable and easy to follow.